It was a little too........country for me so I decided to add some hand-painting to the sides. A Heather Ross Mendocino mermaid makes it much cooler, right? My questions are (1) What should I paint on the other side? the same mermaid? the other mermaid? an octopus? just fish? (2) Should I paint some fish or more seaweed on this side? (3) Should I add some seaweed or fish to the slats in the middle? I'm being very cautious because I'm worried this project could fall into "overkill" without meaning too. I just want something cute and decorative to go in my sewing room and hold projects. The skin color is a little too pink for me, but I had to work with the paint I had AND I painted this at night so my perception was a little off. I could repaint the skin, but I'm not sure I hate it that much. What are your thoughts? 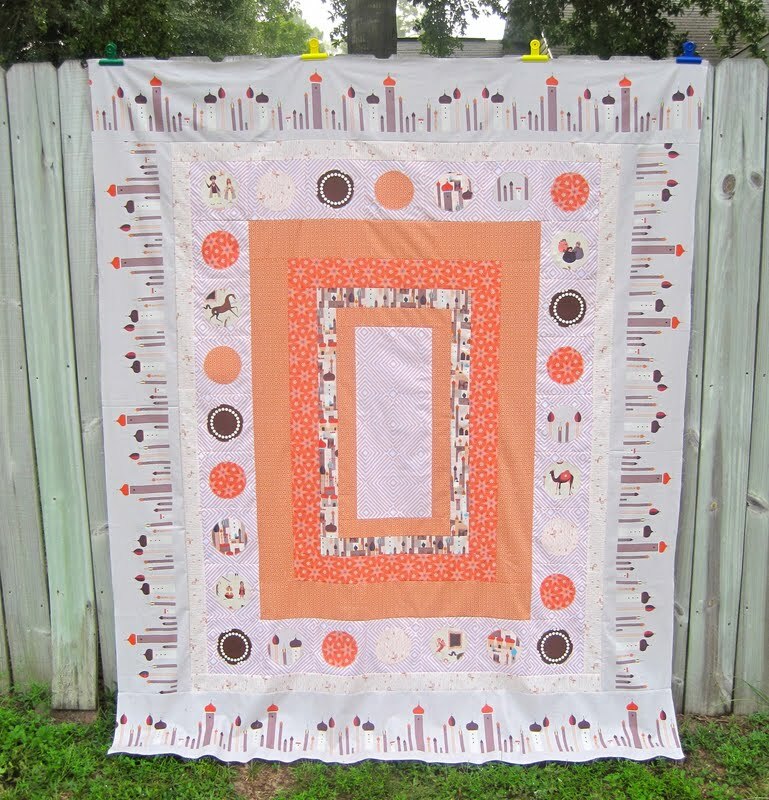 I also finished this Lizzy House Magic Carpet quilt top! I really love this color palette--it's new and different for me. My question is, how in the world should I quilt this? Should I do different quilting in different sections? I refuse to send my quilts out for quilting so it has to be something I can do at home. I'm *really* tempted to free motion it, like I do everything, but I don't know if that's the best thing for it or whether I'm leaning on my crutch out of fear. Here's a shot of the appliqued circles. first of all, your handpainting is incredible! i could never do anything remotely close to that. 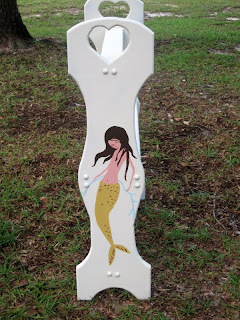 i think the other mermaid on the other side would be great! the painting is great! I think I would maybe add a few fish to this side and the other mermaid to the other side with a few more fish. I think this was a fantastic Re-Do!!! I don't know that I would add anything to the quilt stand. It's lovely the way it is! Very cool idea! I am VERY impressed with your painting skills! My quilt rack (also from Goodwill) is always too full for anyone to see the middle slats, so I wouldn't bother painting those. I like the idea of the octopus on the other side, and maybe a few fishes up near the heart. You need to teach me how to be as productive as you are! Holy smokes, are you kidding me? Your painting looks awesome! I think I'd go with the other mermaid on the other side or an octopus. But, seriously, you can't go wrong. And that quilt is awesome too! I think I'd be tempted to FMQ too, but that's also my go to. Okay, I'm going to stop typing before I write "awesome" again. Love the mermaid. I think the skin color is fine. And I think you should go with an octopus on the other side. Or the same mermaid. And the quilt is so fun. I know you hate straight line quilting but I think a larger quilted version of the line pattern In the center fabric would be kind of cool. It might be too difficult to maneuver though. I love your painting, and I think you should do the girl in bikini on the other side. I think that you cannot go wrong, because the quilt is already GREAT. The quilt rack looks great! I tend to think less is more, and I love the Octupi, so I would paint one on the other side and be done with it. The quilt? I think the pattern speaks for itself, so FMQuilting it would let that stand out. I would either FMQ all over, with a circle outlining the circles... OR echo the pattern with rectangle in rectangle straight line. Wow, your painting is amazing! I think little fish amongst some seaweed would be nice, or a octopus would keep things proportional.. 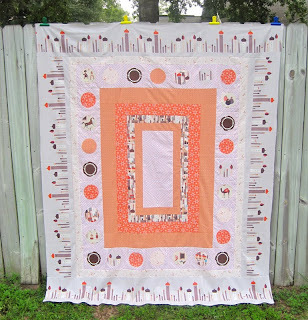 I like the idea of fm'ing the quilt, I think it would let the fabric pattern stand out, but still compliment the quilt very well! I would do something really simple like a little pink starfish. And I wouldn't worry about "messing it up"...the mermaid looks so fantastic that I think that's impossible! Wow, that mermaid is great! I think you should do something similar on the other side, but not the exact thing. I like the octopus idea. I don't think you need to add anything else to the mermaid side. I love just the mermaid on one side! It would keep it simple and special. If it's going in a certain room of your house you could make sure that she faces the door into the room so she's visible! 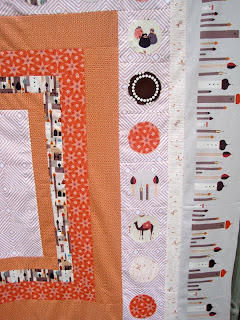 For quilting, I think it would be SO cute to do an inch in around on each of the rectangles. Just straight lines mimicking the shape of your blocks! My opinion: The mermaid is perfect, love the skin color, leave it alone. I would paint a long and lean octopus on the other side with long dangle-y tentacles, to mimic the shape of the mermaid. Long and lean. Maybe on the front on the center rung hand paint a few small fish there and no more than that! What a great goodwill find! 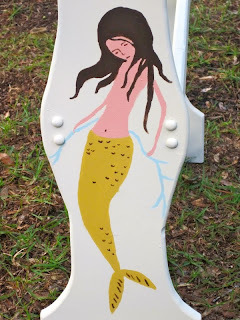 I don't feel qualified to comment on your mermaid, though I think she's really pretty, but I might offer some advice on quilting the MC quilt. 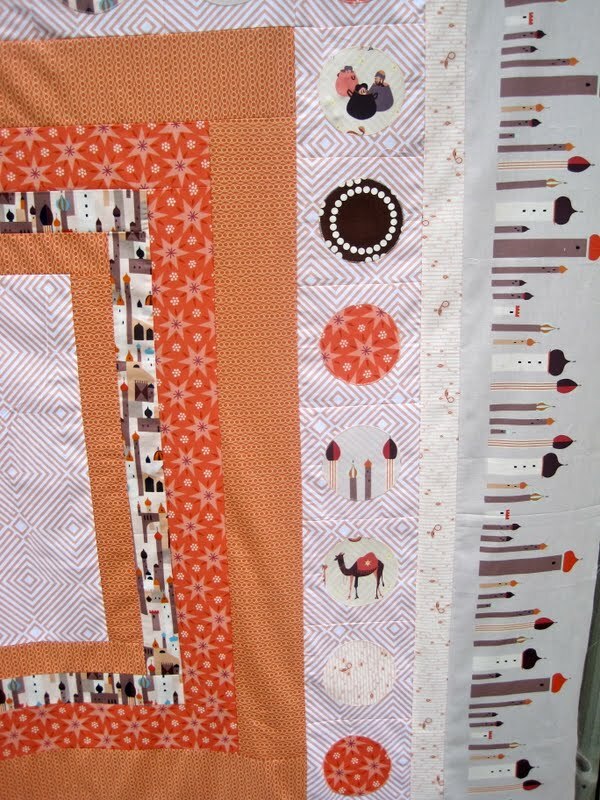 Quilting in sections is a good approach, but instead of quilting EACH section separately, combine a few. I see a couple nice combos. Begin with the center, and then maybe quilt the next four rounds as one. I'd quilt large circles. Can you make a circle template the same size as the appliqued circles? Cut them from freezer paper so you can position them where you wish, and reuse them. That's just a start, but I hope it's a little helpful as you choose what direction to go. You have lots of options! Wow! Your mermaid looks beautiful. I would leave the slats the way they are, otherwise something simple, since they might end up getting covered. As for the other side, I think another mermaid would be great, but the octopus would be pretty cool, with some fish and seaweed. I can't really offer any advice on the quilting. The quilt is great though! Oh my god, girl! I can officially say... I love to hate you. But I love you just the same. :-) You're so good at everything! She's beautiful! (but maybe she needs some little boobie outline? I would say the octopus long and lean (as mentioned before) and maybe a few fishies for interest. It looks just like her surfboards. LOVE. For the quilt, I dunno? maybe just use some FMQ here and there, but not everywhere? like maybe just in every other rectangle? outline the circles, etc. The 'country' comes from the heart cut outs on the sides of the rack. Cover these over with a wooden disk or block from the craft store. Of course you need to paint on them! Love the mermaid, but alternate fish or the octopus on the other side. Quilt the top as you made it - medallion style. First the center then the borders. Just found this on Flickr and it's fantastic! What did you end up doing on the other side? LOVE Mendocino! !